Introduction, transcription, and translation by Carlos Gómez. 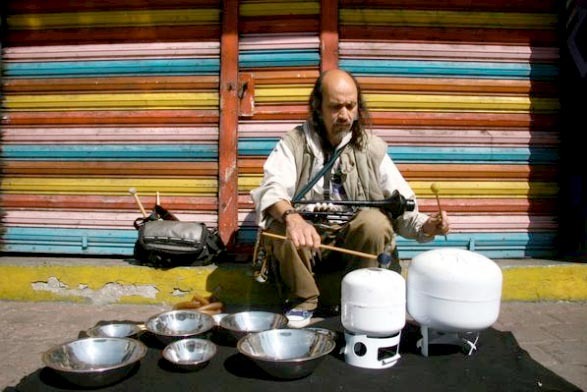 Free musician Germán Bringas is one of the most prolific and prominent underground musicians operating in Mexico City. For almost two decades he has developed his own musical language, working, dreaming and performing improvised music, working in a cooperative net of local colleagues immersed in free improvisational and experimental forms. Initially influenced by the oniric teachings of Carlos Castañeda, Bringas has developed his own ideals, and performed concerts in México, Germány, France and worked with Scott Forrey, Fred Frith, Chris Cutler, John Zorn, Tatsuya Yoshida, Shelley Hirsch, and Hans Tammen, just to name a few. Although his music has always been underestimated, underrated and created in marginalized contexts, against all odds Bringas has created an amazing discography and promoted and developed a unique but always interesting scene of improvised music with local and foreign musicians. Expanding his ideas through interesting music ensembles, Germán's body of work could be considered a pure form of art: honest, without compromising his concepts, but always committed to his art. His music, individual but at the same time universal, seems to be one of the most direct ways to represent the many faces of Mexico City, one of the biggest cities in the world: fragmented, complicated, chaotic, complex, but at the same time majestic, serene and reflective. By the time of this interview, Mr. Bringas had more than 60 self-released recordings made by himself and his fellow musicians on his own label Jazzorca Records (founded in 1991), including two box sets of seven compact discs each, Zona de desfragmentación I and II, that include work from many of his various projects. After a couple of calls, always serene, humble and kind, Germán agreed to be interviewed by New York music journalist Steve Koenig, accompanied by some music friends. The interview took place on December 15, 2010 in the Jazzorca Café, Bringas' operations center and space for intimate concerts, located in his house. Entrevista a Germán Bringas por Steve Koenig, en español. Germán Bringas interviewed by Steve Koenig, in Spanish. Part One - 42 minutes. SK: Hello, we are here with Germán Bringas and the traffic noise in Jazzorca, his studio and performance space. As you may notice (laughs) Spanish is not my first language, and Germán is going to speak in Spanish, his language. Thanks for inviting us. I'm here with friends [Carlos Gómez and Edgar Osorio] who will help when I need it. I want to know, not specifically musical influences, but at any age or period in your life other arts that were important to you. GB: There have been various artists, and also very important to me when I was very young, recordings of Rock In Opposition. I received a large amount of records since I was 13-14 years old. I found so many records. I was very young but l was listening to all kinds of musics: Louis Armstrong, Clark Terry, Oscar Peterson, at the same time Sun Ra, Ornette Coleman, at the same time Art Bears, Aksak Maboul, Univers Zero, everything at the same time, every week I got two or three records, so I was fed with all this. I didn't understand Free Jazz but I liked it, It was very complex to me around that time. So what I understood most was R.I.O. I liked very much the sense of humor of that entire crowd. The Residents, Lol Coxhill. They made a compilation called Miniatures where they had 53 different groups on the same LP with tracks of less than a minute per group. And I said WOW! I enjoyed so much all this sound information that I couldn't decide what to learn to play or study. I wanted to play everything, so I started to improvise and compose my own music and I saw that what I couldn't play easily and I didn't like to study was jazz. Be-bop, I didn't like it. I really don't like jazz standards. I really don't like standards, commercial North American music, I hate it! (Laughs) So standards have a lot of it, even bebop, it's different because of its speed, but if you studied slower (if you want to play it you have to learn it slowly) it has all the American flavor of the '40s that I didn't like. So I choose the freer aspect of music and R.I.O. I feel some of my former years are based on that music, that some time later the same musicians stopped doing it, there were only a few years that they composed the best of that music and then they converted to improvised music or experimental music only. so many names in different eras. At different times I was very impressed by the work of Jan Garbarek, Keith Jarrett, at other times John Zorn, Fred Frith. Now I like very much to listen to Charles Gayle, David S. Ware, these free jazz musicians, even some musicians I don't know and I started to know like Rob Brown, that I enjoyed so much. SK: Rob Brown is one of my favorites!! GB: But not only music, the work of Carlos Castaneda also was very important to me in my early years. I met him when I was 16 years old and I worked with some people close to him for eight years, so I learned a lot of things in that field. During all that time, after I had my first child when I was 23-24 years old, I started to work alone on the entire subject of perception. I don't follow any doctrine, neither Castaneda nor anyone else. I discovered things and techniques that I practice by myself and if someone wants to learn something I will teach. I don't earn money for that, but in general I don't have any followers, nor do I want someone to follow. SK: Can you explain, how do you use Castaneda's ideas, or is it an more internal thing; I confess I don't know his work. I know about him because a lot of my friends have read him, but not me. GB: I don't use Castaneda's Ideas, his way of describing the whole process of perception, I don't apply that, but what I do is similar. What I found working for me has a lot of points in common with Castaneda. So I avoid his terminology, I don't share this, and the form to apply the techniques, I developed them myself. I don't do processes that were used by them, but only the ones I found myself. So the people that use his work, for example "la tensigridad" (a complex technique of contraction and expansion of corporal movements used by Castaneda to keep an internal dialog in order to achieve internal knowledge), for me, I have a different vision, to me the "tensigridad" they developed was a marketing strategy to make more money. That's why I'm not interested in that, but I know it works for a lot of people because it's like doing Tai Ch'i and there is no doubt that it's useful for a lot of people, but I did a lot of hard work in the that field, work that was much more interesting to me, so I feel "tensigridad" a little bit boring and I greatly prefer to play free jazz. SK: Most of the artists I know are influenced by other arts than their own art. For example, Cecil Taylor is very influenced by dance. I'm a poet and music is my influence, even if I don't copy the rhythms of the music. it's not like my genetic code but it works that way. Do you have an art that influences you? GB: Yeah. Music is my favorite! (Laughs) More than an Influence, I have shared the stage with visual artists, and with my partner Martha, she has been with me over 25 years. She does contemporary dance using her own language, and since I met her what caught me was that I saw an artist with her own authentic and unique language. Most contemporary dance doesn't look like what she was doing. So it was the same way for us, very similar roads. She is into dance and I am into music and it had worked out because here we are after so many years. SK: What is the meaning of the title Zona de desfragmentación? GB: I called it that to describe in one word what happens in my brain, in my mind, when I do my main exercises. With the perception work it happened those years ago after practicing a lot that my relationship with something completely simple, my relationship with dusk changed. Every day of my life I have to go out at dusk. I need to go out at the precise moment of dusk, in that moment something happened in my head, like a magnetism, a frequency, very beautiful and strong, very, very strong, and I need to experiment with this sensation every day, otherwise I start to feel very bad. It's like a drug. To me it doesn't matter if the colors are pretty or there are no colors, if you have pink or violet; it's not about the color, it's another thing, like magnetism-. So this state that changes in me at that moment, permits my whole attention to be separated [isolated, or focused]. I'm hearing the world as if it were music and everything seems funny to me, everything I see seems incredible, like a total visual and sound improvisation and that for me is that is "zona de desfragmentación," that my mind is subdivided in all different parts and all can pay attention at the same time in the same instant and there is no problem. The unique thing, and the best, is that I cannot process words in that moment, the reason cannot work, it's like a drug, but I don't have to take or do anything, it just happens. I just need to walk by dusk, it happens and that, for me, it's my best achievement, because I see other people at dusk and for them It doesn't exist, nobody seems to enjoy this and nobody experiences something like this and to me it happens all the time, so in one moment this might be like a contribution that this can happen with something so simple that occurs everyday. SK: What motivates you to release two CD boxes in an atmosphere where it's difficult to sell even a single disc? GB: (Laughs.) Yeah, well I wanted to make recordings to support musicians. Musicians who have my own condition, someone who doesn't have any particular style, who creates his own thing, his own music that doesn't seem like others, I wanted to support musicians who have their own language. At some point I made a record for musician Marcos Miranda. After I made a record with a Canadian musician Angelo Moroni and I did all the work, so when we were finished, and the record was ready, these musicians said ok, we are going to make another, the one that we made with you is past now. And I said we need to make concerts and sell the discs. They said no, you need to do that, and I'm like, I play my own thing, I try to sell my own records, how can I sell yours if you don't help me? I don't know, I'm doing now something else and that's it. So I said WOW! This way I cannot go on. Musicians don't want to do the complete work. So the experience with café Jazzorca over the course of 15 years, more than one thousand concerts, more than six hundred musicians had performed here, the scene seems to be more specific about what we want to do, the type of improv or improvisers. I still have a treasure, where very unusual, astonishing actions happen every week, now even with my own sons who make their own improvisation ensembles, and I am still learning and being surprised about was happening and I can record anything I want, so I said, I want to support you but with other kind of strategy. I don't have to expect anything from them, if they are not going to do anything. So I said when I make a record with my music, instead of making all the work for just one record, take advantage of the opportunity and make lots of recordings for all musicians, second box includes fifty musicians participating, so it's a strategy: instead of making just one promotion for just one thing It help to promote many other musicians. It takes more time and it's more difficult to sell a box for 100 dollars than a CD for 10 dollars, but I don't see this as a business. It's very, very slow, but if I take away the economic aspect, I enjoy this work alot and little by little its sells, and of course when I sell something it's a great help and I have a lot of joy. Also I didn't get interested to continue in the world of stores, selling records to stores. It's so exhausting and less valued than here in this place [Jazzorca]; it's limited to the capacities of the place. Only the people who come can buy, but at the same time people like you, who come from different countries, musicians all over the world, people from Serbia, France, and with more frequency from all over the planet. So the place works and it becomes a complete weapon, even if a small one, but it works well. SK: Yes, this space is very important because a lot of people know of it. And it's a little like the loft jazz era in New York in the '70s, but nowadays more and more people open their own places or homes to perform interesting music. CG: I would like to know, the idea of promotion and interaction in Jazzorca and the recordings you made and people who perform here. GB: As I said until now we have 64 productions. The first were cassettes, nearly 21 cassettes when I started to make CDs, with different opportunities we had. Label Opción Sonica (now defunct) offered to make a record with me, and we ended up doing like six different co-productions. That helped to put my records in stores and to make me say, that doesn't work for anything. (Laughs.) So I decided to not make anything else with independent labels or stores. To me, the success of production, what encourages me to make records is that not long ago after I made the two boxes of seven CDs each, suddenly someone from Tijuana said I want all the collection and I tried to reunite all the records I produced and I have realized that all the records had sold out, almost everything I produced was sold out, so I said, well it seemed It doesn't sell, but it's all gone! I only have seven discs left of all the productions and the boxes, so it's a thing to be happy, because nothing was overstocked. CG: In fact some of your first recordings are very difficult to get. EO: Almost impossible to find! GB: Yeah even for me, for example, from my first record "El Salto," I don't have the covers, I just have the CD and the front covers of the booklets. (Laughs.) Of some productions I still have the masters and the covers to make up the CDs, but I don't have reissues. EO: Approximately how many records do you make of each production? GB: Each time I made 500 of each disc, but sometimes when it was a co-production we made a thousand. We made two thousand of the Fred Frith recording, but someone once told me that they made more copies, something that was not permitted because we (Fred Frith, Chris Cutler and I) signed a contract saying we cannot make up more, but I think the producers made more of this record illegally. I don't know, but I'm not interested anymore. I still have 20 copies of that double CD. When I have ten I will sell no more. CG: Now that it's so easy to get music from the Internet, and considering you have a recording on Ayler Records, does this way of selling and distributing the music seem to work for you? GB: I hope it will, but our only experience is with Ayler Records. After a year and a half our part of the sales was just 300 pesos [approximately 30 US dollars]. (Laughs.) So now it didn't work for us. I have to take care to not let anyone upload my records. If I know someone is going to do this. I prefer not giving [away] my records. They have the ability to do it but I'd rather not, I don't want that the complete music would be pirated, because we already invested money and time to make the CDs in order to sell them, so I don't want this to be given away over the Internet. EO: It could be harmful to you if someone uploads Zona de Desfragmentación over some blog to download for free. GB: Yeah, how could I sell the ones I got? EO: But do you think this form as a promotion? Like if some Japanese could hear the record and said now I want this record. GB: Yes, it could be like promotion, but if you see world situation, I see this in the case of Ayler Records, you see how many people had listened the record, but from all the many people who have heard the record, only three people had bought it, and they are in Switzerland where supposedly the conditions are different, but anyway, selling is not so simple. What I do prefer is what Steven proposes; to give something that is not officially released, as a promotion, so in this sense I have a huge amount of material that I would like to spread. There are two things that have stopped me. It takes a lot of time, one, to prepare a record, even just the distribution, all the work must be done well and I don't have the time, and the second is that I need to decide of all recordings which are going to be a record to sell. I need to think, because it's material from many, many musicians, 15 years of Jazzorca. Every week we have four different concerts. CG: Do you record everything? GB: No, after the second box I stopped recording. Only when I got a recording device like this I started to record again, but now my percussionist son is in Africa and he took my device and we cannot record now. (Laughs.) We are desperate to get another; once you start recording you want to record everything. SK: Was the sax your first instrument? GB: No, It was the piano, I'm a pianist. I studied classical piano seven years starting at the age of seven years old, and my experience was very good because I learned a lot of technique and interpretation from a lot of composers. I liked to play Bartók and Bach, and also the impressionists, but I saw that academic milieu when I was at school over the course of three years. Teachers didn't know what to do with the people who had a different language; they told me it was better not to improvise, not to compose until I studied composition, and that it was good I had a good ear, but nothing else. But since I was seven years old with the first piano I had in my house I saw colors, different colors, with every sound. I didn't know the name of the notes but I saw every time color and formed combinations, metallic blue, clear green, brown, deep violet, black. SK: You saw the music in colors like Scriabin. GB: Yes, some place in my head, and I never thought that will serve but when I left school I continued improvising with this, and it works, and I'm pretty sure a lot of musicians should learn that because it's marvelous, so I had developed exercises for kids so they don't lose the synaesthesia, or so musicians could get back the capacity to see the color of sounds. SK: Which instruments do you play now? GB: I play trumpet, saxophones, and piano. Also I'm working with this instrument made from gas tanks. It's an instrument derived from the steel drum, the hand drum, and this is a version of an instrument by American Dennis Havlena. SK: Talk about those please. In front of us, there is a handmade instrument. GB: This is an instrument made by Dennis Havlena, invented by him, based on the hand drum. That is an instrument derived from steel drum built by two Swiss people. It sounds incredible, but it's very expensive, like 2000 euros, and if you want to get one there's a list of 1000 people waiting for one and when it's ready you need to go to their home in Switzerland to buy yours. (Laughs.) So Dennis Havlena said it'd not fair, anyone should be able to have a beautiful sound like that, so he invented on a gas tank making keys: the tank drum, and the patent was donated, he uploaded his own scripts to make it by yourself, whoever wants to this it's very simple and cheap. So I immediately I saw someone on youtube making one and I started making my own. I already have made like 20. I have sold some of them to percussionists, the contemporary percussion group Tambuco, they have bought five, to my brother who is a tabla player, and I use them. I made a concert where I play alone, because so many things had happened to my bands which had been unstable, so I made a concert with 10 compositions where I only play trumpet, soprano saxophone and tank drum. So what I did is that I abandoned the templates of Dennis Havlena and I try to find other tunes that are interesting for me to play, because what they do is that are tanks in pentatonic scales, and I have done Hindu scales, symmetric scales, jazz oriented scales, and tanks completely out of tune that are beautiful (laughs) to play free jazz as well. SK: I want to ask about your different groups, because when I saw you for the first time it was at the Mexican Radar Festival two years ago, at the Zinco Bar. Your first group was ELRA, in which you have dancers and many, many musicians which, to me, was reminiscent of Sun Ra's Arkestra. After that, I was so filled with so much happiness and joy that I went to speak to you at the intermission. After that, to my surprise, the second set of the concert was an entirely different group, Zero Point, who recalled, as an easy comparison, Tim Berne's Bloodcount; ferocious but not just that. The energy and music were incredible. So I would like you to explain something about your different groups, please. GB: Yes, the situation was also a surprise to me. We play some improvisations here regularly with different musicians and we liked what we did so much that we programmed another concert and it ended up with us forming a new group. When I realized there was no time for rehearsal, only for concerts, at some point I had seven to eleven different groups and I wanted to work with all of them, so it was complicated and I had to select some groups. A musician's contribution is always important because if I work with electronics I generate this type of improvisation, oriented to or affected by electronics, but I want to use objects. I called them PTR objects [Bringás tells me "PTR" is a joke which won't translate], like trash, a plastic cup, marbles, bolts, but at the time it's mixed with electronic machines; we generate another sound style I also like. So I decided to work only with seven bands. That was the fewest I could do because I like all these groups and we feel comfortable playing together. The problem begins with how can we get more paid concerts, for all the groups, so it happened the same with the records. It was a delusion because the only one getting concerts was me, all the musicians were only waiting. So I was spending a lot of time trying to get concerts. Some groups have performed just a few times because of the difficulty of the music, like Zero Point, only the people who like free jazz as you do, who enjoy the music or like free jazz and recognize their work, but Zero Point could never play in places like "el combite" or "New Orleans" [clubs in Mexico City]. Like that concert at Zinco Jazz Bar. It was very funny, because later on at the press conference, one of the owners of the bar acknowledged in public that they were deficient in their work because they didn't permit us to rehearse. He put a very clear example when he said, "Here at Zinco we search for jazz that looks like the French idiom. You hear French and everybody likes French; even we don't understand anything. It's something that sounds nice, a jazz that everybody likes, and what they do (Zero Point) it's truly jazz, it's truly interesting music, but the majority of the people if they don't understand it, they don't like it, so for us that represents that there is no money in it and that is why we couldn't let them play." So this is a sad reality in this country. Zero Point had played a few times, two years ago we played at the Ollin Khan Festival, we were invited and played with Elliott Levin, Zero Point with Elliott Levin, and it was great, we gave three concerts. So lately I had two of the bands, a trio where I play the piano (the bassist who was also playing in ELRA, the African group, died four months ago in a car accident), so coincides that my son is traveling a lot. With my son I had four different ensembles, but now he is in Africa, so it's a good moment to redefine my bands' work. Nowadays I'm only doing rehearsals with the African group and playing concerts with Zero Point, and the orchestra. I have a bigger ensemble called ORCA which is an improv-reaction orchestra directed by signals. We are going to play here next Saturday. For the past two years, the ORCA plays every last Saturday of the month, a very nice ensemble. SK: Was your signals group based on your own ideas or did you learn from people like Butch Morris, John Zorn and others? if we are going to improvise, don't ask me; listen to what is happening, and they asked me again, what can we do? They insisted, and I said let's play a game, and I made six different indications with numbers. It was a simple six numbers. We marked the number to improvise: one number was to improvise like birds, bird sounds, another signal was for something else, so it worked out so well. Later in 2003 at the Radar Festival they invited John Zorn to play a solo concert with William Winant, and other concert he wanted to do Cobra with Mexican musicians. They said, we have Hector Infanzón, Eugenio Toussaint, who are well-recognized musicians oriented to commercial jazz. They proposed some known Mexican jazz musicians and Zorn said none of these musicians can play this. Ok, we have more musicians, like Horacio Franco, or performers of contemporary music, Ensamble Onix, La Banda Elástica, and Zorn said no, none of these musicians can play this. I need this specific type of musician, so I went with my records to propose myself, and the people of the festival said no, he won't let you play, so the next day they asked Zorn and he says, this is the musician I want, the one who can play Cobra, and he can assemble the group, he has all the musicians who can play Cobra, so I was very happy. I united 14 musicians and we played Cobra under John Zorn instructions, and on the later press conference he said was the best Cobra ever played. Germán Bringas will be performing with Evan Parker, John Edwards and Chris Corsano at the Festival AURAL in Mexico City, March 18, 2011.